Do you have a student who needs to use a switch for access? Do you have a student that needs to progress from cause and effect to scanning? This course is designed to explain what a switch is, how it is used and to identify software that can support your switch user for use on their level and how they progress to the next. A Switch Interface is a device that connect the switch to the device. 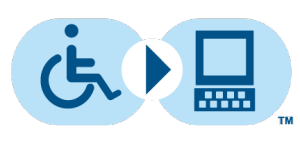 Most devices (unless specifically design for those with disabilities) do not have a port to connect a switch and so switch interfaces fill that gap. They can also be used as control centers for functions. For example: a computer switch interface will allow different mouse functions to be controlled through different switches. Various switches and switch interfaces can be borrowed for 2-3 weeks from the T.A.S.C. lending library. We are getting closer every day to having all programs be switch-accessible, but unfortunately, we still have quite a ways to go. Below are listed a very programs that are switch accessible. If you have any programs you would like to add please mention it in the comments below! iPad switch interfaces can be borrowed for 2-3 weeks from T.A.S.C. Lending Library. Anyone can create their own switch. If you have access to a 3D printer, you can print out your own switch (with a few other materials needed) for about $10! Thank you to the UAH Students in the engineering department for creating a wonderful inexpensive Switch design!